Quetzalcoatl comes from the world famous Snowmass Stud in America and epitomises those traits that we sought to introduce in to our own breeding programme. 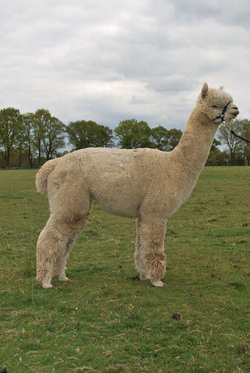 His magnificent presence makes him standout in the stud paddock, perfect phenotype, tremendous density and staple length, allied to a very stylish fleece and still holding excellent fineness. Quetz as he is fondly known, is consistently producing beautiful cria with stunning presence from a very early age, but above all else these cria are showing tremendous density in a beautifully uniform and well organised fleece.